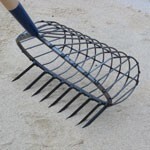 Stainless Steel 9 Tine Basket Rake - Rakes - GoClamming! The first recreational basket rake we offered, and still our best seller! Versatile in sand, mud, or rocks, this rake has a generous basket capacity and is used by recreational and commercial shell fishermen not only for quahogs but also for oysters. A good general purpose rake.